Present an enormous, enigmatic video installation by Pipolotti Rist in the atrium of the Museum of Modern Art. Place a large circular cushion in the center. Give the kids digital cameras and let them loose. Watch them cavort, snapping pictures in every direction. Parents, lie back and rest your feet. 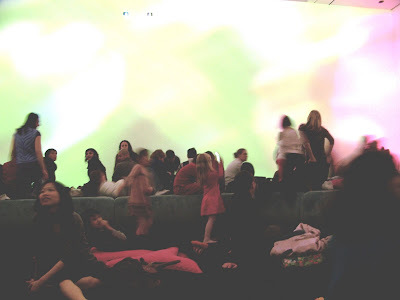 As the art scholars discussed the meaning of Miro's experiments with Surrealism or the technique of Sol LeWitt's giant geometric scribblings, families were relaxing and kids were giggling with delight. The video installation "Pour Your Body Out" is on display through February 2.